1 cup all-purpose flour plus 2 tbsp. Toss the peach slices in a large Dutch oven or heavy-bottomed pot with the sugar, cinnamon, water, triple sec, and lemon zest. Cook over medium-low to medium heat for 10-12 minutes, stirring occasionally to make sure nothing is burning on the bottom of the pot; there is a lot of sugar in there! 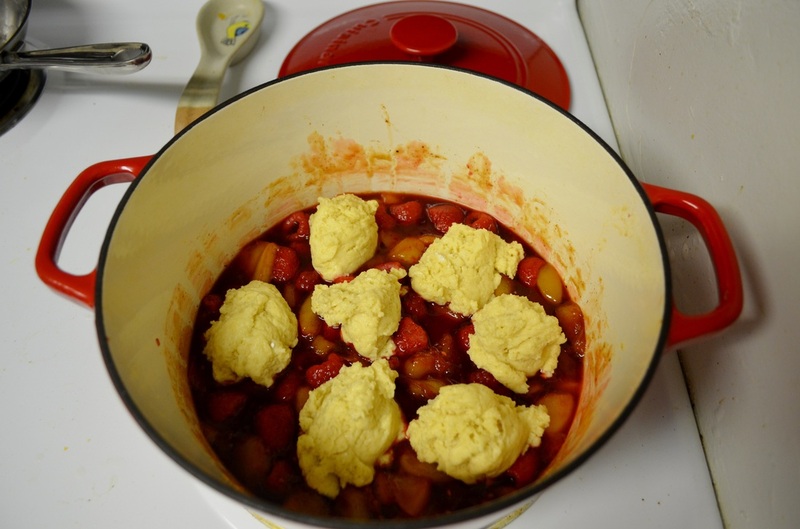 The mixture will start to look jam-like and smell tantalizing. Combine the buttermilk, melted butter, and vanilla in a small bowl or glass measuring cup. It is important that the buttermilk is not freezing cold because as soon as you add the melted butter it will start to solidify again. If this does happen, just pour the whole thing into a small skillet and cook over very low heat, stirring frequently, until the butter has re-melted. Whisk the flour, baking powder, baking soda, salt, and just 3 tbsp. of the sugar together into a bowl. 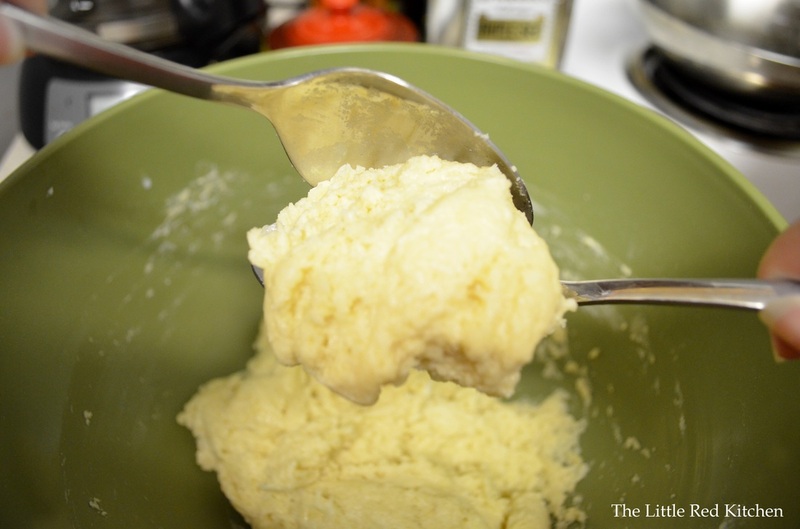 Then pour the wet ingredients in and stir just to combine, until there are no streaks or spots of flour left in the dough. Using two spoons, scoop out the dough and shape into golf ball-size mounds. 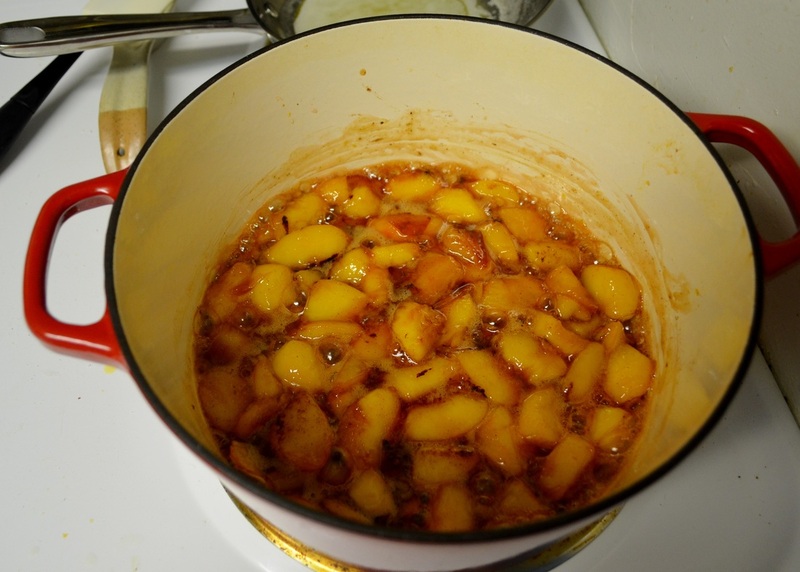 At this point just drop them onto the peach mixture in the pot. You should get seven “biscuits”. This last step is kind of weird, but necessary. Take the lid of your Dutch oven and wrap it in a clean kitchen towel. Then place the lid on top of the pot. See, the biscuits will be cooked by the steam in the pot, but that steam will go up to the lid and drip right back down, making soggy biscuits instead of fluffy ones. 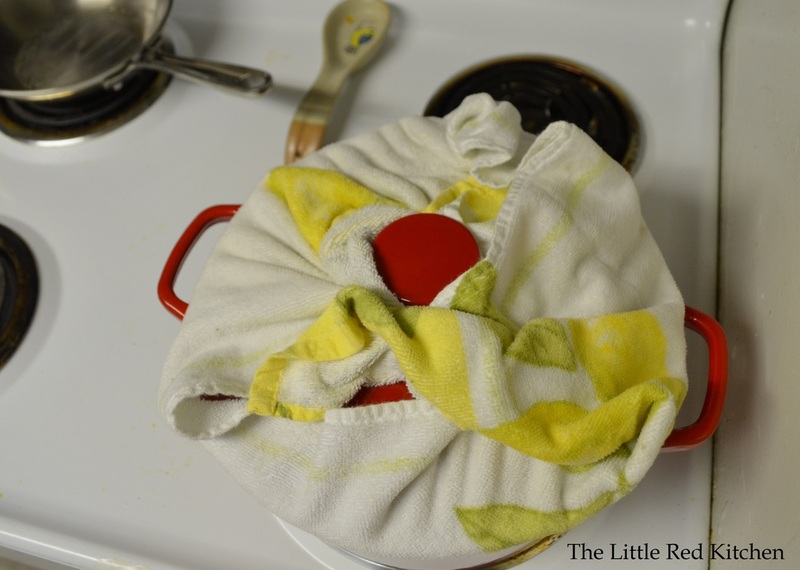 By wrapping the lid in a towel, the towel traps that excess moisture. Safety Note: If you have a gas burner, PLEASE make sure that the towel cannot, and will not, fall down and come in contact with the flame. 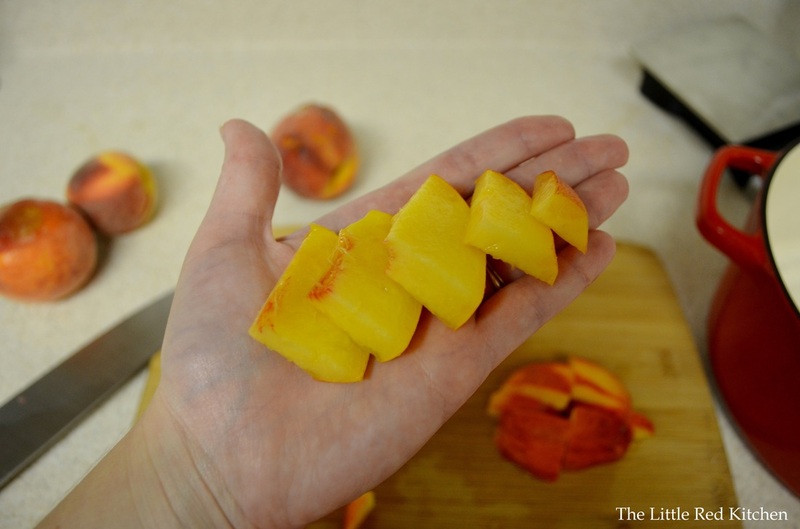 You really don’t want to burn your kitchen down over Peach Grunt. 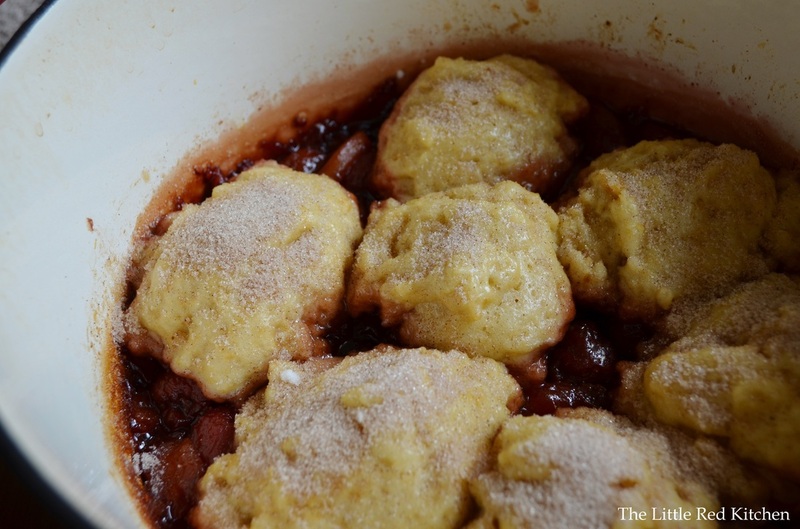 Simmer the biscuits gently, over medium-low, or even low heat. This is very important. If you have the contents going at a full boil, the biscuits aren’t your concern, but the fruit burning and blackening into a tar-like substance on the bottom of your pot is. Low, and slow, and steady, wins this race. 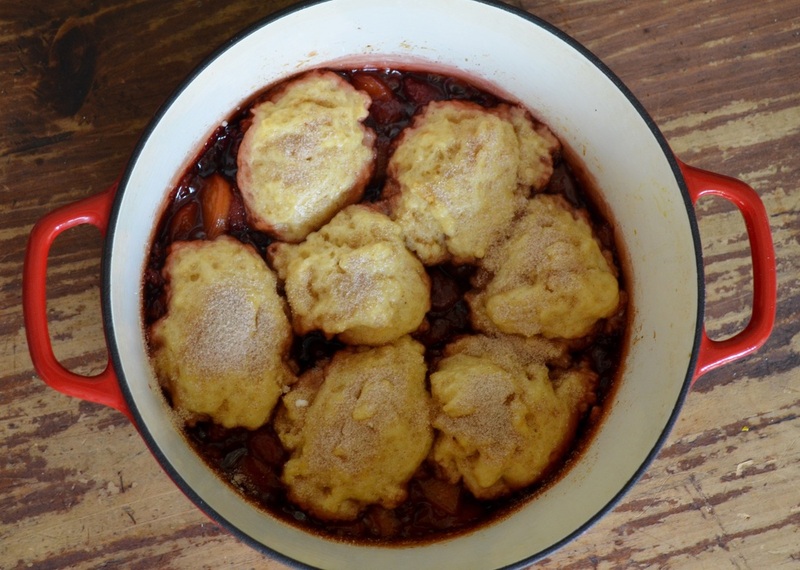 Cook at this gentle simmer for about 16-18 minutes, then head into the pot with a toothpick and test the biscuits. As soon as your toothpick comes out clean, they are ready. Again, if this takes longer at the risk of not burning the fruit, it’s worth it.Then, just combine the remaining tbsp. of sugar with the cinnamon and sprinkle over the top. This combo will create a deliciously crunchy and craggy exterior, the perfect contrast to those fluffy biscuits. This dessert will serve 4-6 people, depending on how much filling they want versus how many biscuits they want. But if they are smart, they will want a lot of both. Also, a dollop of fresh whipped cream on top never hurt anybody.Happy eating!